The application of fake eyelashes is a fine art and as with most types of art, it takes talent and many hours of practice and preening. If you have always desired longer thicker lashes but the tricky application of falsies has you all a fluster and your eyes stuck together then this product is essential. DivaDerme lash extender may look like an ordinary mascara from the outside, but open the tube and instead of slick black mascara, you’ll find millions of little hair fibres all fighting for the chance to cling on to your eyelashes. The idea is to elongate and add volume without the use of gluing on false lashes. 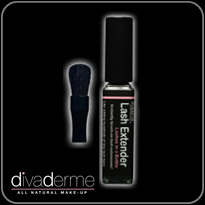 The extender essentially works on the same principle as most eyelash primers, which attach artificial fibers to your lashes using the white end of the mascara, although lash extender enables you to build up a more natural looking thickness and length. At £23.95 lash extender is quite pricey but the Italian brand have crafted the tiny strands with care – each one is infused with Vitamin E, panthenol, and herbal extracts, and they’re safe for contact lens users. Well worth the price.